A cemetery is a rather somber place. When you go looking for your ancestors and find their headstones, you might rejoice a little, however, as I did. The discovery of the last resting place of your ancestors can bring about an overwhelming amount of emotion. That's how I felt the day I realized that I found Henry and Anna Borchers last resting place. -Henry Borchers, age 67, born about 1853 in Germany; living in Santa Rosa, California, white male, immigration year 1867, father and mother from Germany; married to Anna Borchers, able to read and write; Other household members: Herbert, Mary, and Anna. 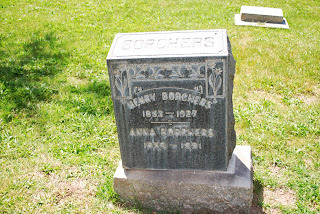 -Henry Borchers, age 58, born about 1852 in Germany, home in 1910: Township 138, Morton, North Dakota, white male, immigration year 1867, head of houshold and married to Anna Borchers; father and mother's birthplace: Germany; other household members: Anna, Albert, Clara, Herbert. -Henry Borchers, age 42, census date: 1895, Aurora, Steele, Minnesota; male from Germany, born about 1853, white. Household members are Henry, Anna, Lizzie, William, Martha, Henry, Albert, Matilda. -Henry Borchers, age 32, census date: 1 May 1885, Aurora, Steele, Minnesota, male from Germany, estimated year of birth 1853, white. Household members are Henry, Anna, Elizabeth, William, and Martha. It does help to have the inside track on Henry Borchers' given name. My uncle has provided me with more information of Henry's origins in Germany. His given name was Hans Heinrich Conrad Borchers. He was born the only child of Catharina "Thrine" Engel Borchers (nee Blume) and Johann Conrad Borchers. Henry's father died in 1854, within a few years after Henry was born. Henry lived his life as an only child. I can't forget to mention that Henry was technically from Prussia. Much of Germany was actually Prussia during the 1800s until the great war. He was also Lutheran. In Germany, Lutheran's were referred to as Evangelicals. The following dates and information are based off church records that my uncle retrieved. Henry was born and grew up about 30 miles due west of Hanover, Germany. Why his mother made the decision to leave and come to the USA is not real clear. Many German immigrants came to the midwest of the United States during this time looking for a better life. They clustered together in their own German communities. 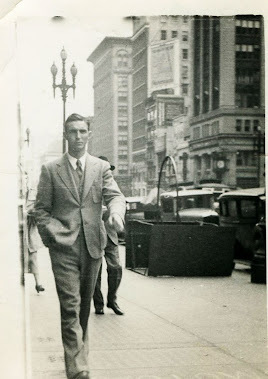 It is possible that Thrine (Henry's mother) came to the United States with plans to marry Hans Henry Steege since he was a widower (and she was a widow) with several young children already living in Indiana. Sourcing and proving Henry's locations stateside in the United States has proven to be an easy task. I often wonder what he was like. Most of the census information simply indicates that he was a farmer. At least now, I know where he lived and where he was from. Part 3 is next with some additional oral history, even if anecdotal in nature. Photo History - Are There Photos of My Ancestors?